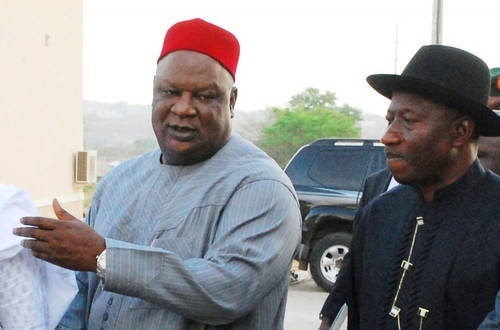 Anyim Pius Anyim and Goodluck Jonathan. Anyim Pius Anyim's arrest was not unconnected to the Abuja Centenary City project fraud. Former senate president Anyim Pius Anyim has been arrested by the Economic and Financial Crimes Commission. Anyim was reportedly picked up in Abuja on Thursday night. The arrest was not unconnected to the Abuja Centenary City project fraud. Anyim, who served as the Secretary to the Government of the Federation (SGF) under the former president Goodluck Jonathan administration, is answering questions from the commission over project in question, which cost over $18 billion. In March 2017, the House of Representatives recommended the prosecution of Anyim over the Abuja centenary city project. On February 3, 2017, Anyim, while appearing before the committee, accused the Herman Hembe’s committee of “deep-seated personal bias”. It was not clear if the former senate president had been released as at Friday morning.